ISO-S PVD grades MP9005, MP9015 and uncoated MT9015 for difficult to cut materials. MP9005 and MP9015 High Al-rich (Al,Ti)N single layer coating technology improves crater resistance and welding resistance. 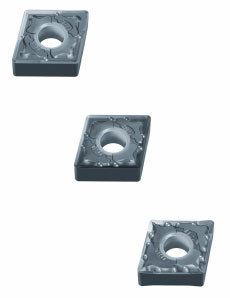 New negative style insert chip breakers LS, MS and RS for maximum efficiency of new grades. LS for stable applications, MS for general applications and RS for unstable applications. Turning applications when machining high temperature alloys. Machining Nickel Based-Heat Resistant Alloys, Inconel, Hastelloy, and Waspaloy alloys. High temperature alloy applications where chip control and tool life are critical. Newly developed ISO-S PVD grade MP9005 focusing on wear resistance. Newly developed ISO-S PVD grade MP9015 first recommendation for general applications. Newly developed ISO-S uncoated grade MT9015, sharp cutting edge for general applications. LS, MS and RS chip breakers to maximize performance of MP9005, MP9015 and MT9015.